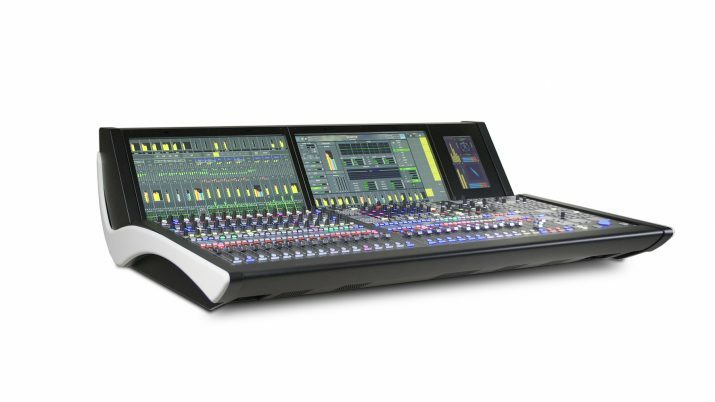 At NAB 2018, Lawo launched four new products, most notably the third generation of the mc²56, marking a further step in the evolution of a mixing console that is in operation around the world. The new mc²56 incorporates features drawn from Lawo’s mc²96 console without sacrificing the identity of its predecessors – retaining the compact size, flexibility and versatile design that address applications ranging from broadcast trucks and studios to live performance and recording. Optimized for IP video production environments, the new mc²56 has full native support for SMPTE 2110, AES67/Ravenna and Dante. Its established best-in-class networking performance rises to the next level with the addition of unique capabilities such as IP-Share gain compensation and DSCA Dynamic Surface to Core Allocation. Available in frames from 16 to 112 faders, the mc²56 supports up to 8,192 x 8,192 crosspoints, 888 DSP channels, 144 summing buses and 128 aux buses at 44.1 – 96kHz operation. In addition to Button-Glow and colored touch-sensitive encoders, new color-TFTs provide clearer color-coding of channel strips for enhanced visibility and faster access in low light conditions, while Lawo’s LiveView provides thumbnail previews of video streams directly in the fader labeling displays. With a 64-fader surface suited to most OB vehicle dimensions, a 16-fader stand-alone extender may be added to an mc²56 for subsequent expansion at any time. The new mc²56’s extended free control section gives direct access to four parameters in addition to gain control for perfect balance between decentralized and centralized control workflows. The console allows both global and individual parameter assignments to the free controls of each channel strip. Additionally, the console’s overbridge with capacity sensing 21.5” full HD touchscreens contains two slots for individual user panels, which can be populated from a choice of five options – 40 additional buttons, a TC automation panel, a dedicated Reveal Fader panel, a RTW TM7 Goniometer or a RTW TM9 Goniometer (occupying both slots) – the choice is yours. Originally requested for broadcast applications, the console’s built-in loudness metering is also useful in live, theater and house of worship applications, providing full loudness control in accordance with ITU 1770 (EBU/R128 or ATSC/A85) with peak and loudness metering either separately or in combination. 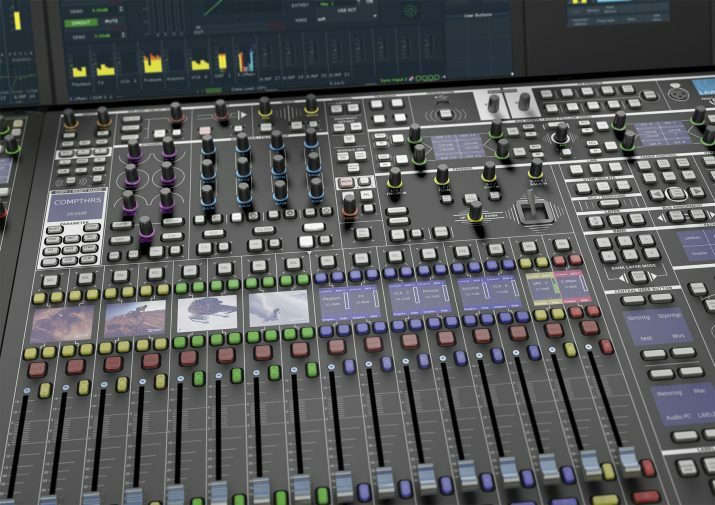 Among the console’s broadcast highlights are multi-user operation, advanced mix assist systems (AutoMix, UpMix, DownMix, optional: Lawo KICK), comprehensive Audio-Follow-Video functionality, integrated 3D/Immersive mixing tools (a dedicated elevation controller is standard) and parallel compression. In recording applications, it offers dynamic time-code automation, Lawo-grade microphone preamps and processing, Machine/DAW remote control and a fully customizable signal chain with four independent dynamic modules. For the performing arts, the console includes Selective Recall, Oversnaps (relative trim-sets), comprehensive theater automation cue list including multiple triggers (MIDI, GPIO, LTC), Waves SoundGrid and Neumann DMI-8 digital microphone integration, and mirror-console operation. The console’s local I/O provides two IP network interfaces for redundant connection of the surface’s local I/O to the Nova73 router following the SMPTE2022-7 hitless merge principles of stream and port redundancy. Comprehensive local I/O includes 16 Lawo-grade Mic/Line inputs, 16 Line outputs, eight AES3 inputs and outputs, eight GPIOs plus a local MADI port (SFP). Lawo’s mc²56 is not limited to a stand-alone operation, but has been designed from the ground up for networking in complex production infrastructures via IP (SMPTE2110, RAVENNA/AES67, DANTE) or MADI. When using shared DALLIS I/Os, Lawo’s unique IP-Share Network Gain Compensation prevents unexpected gain changes for up to eight networked consoles when individual users are adjusting their gain settings. The DALLIS I/O communicates with all networked consoles and its IP-Share algorithm sets the optimum analog gain for multi-client requirements. IP-Share additionally ensures that the corresponding gain compensation is applied to the digital gain stages of all consoles when the analog gain of the preamp is being adjusted. 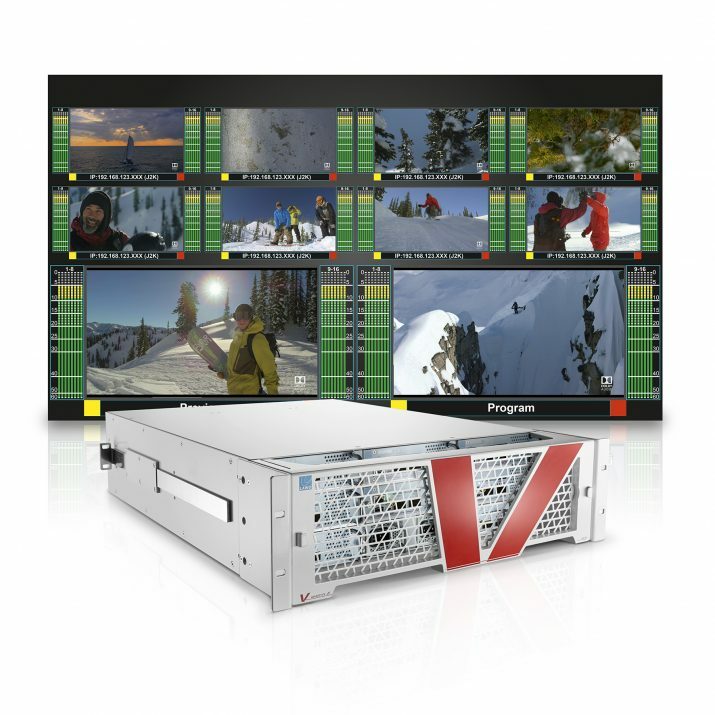 Lawo launched the world’s first infinitely expandable true IP multiviewer vm_dmv64-4 during NAB 2018. 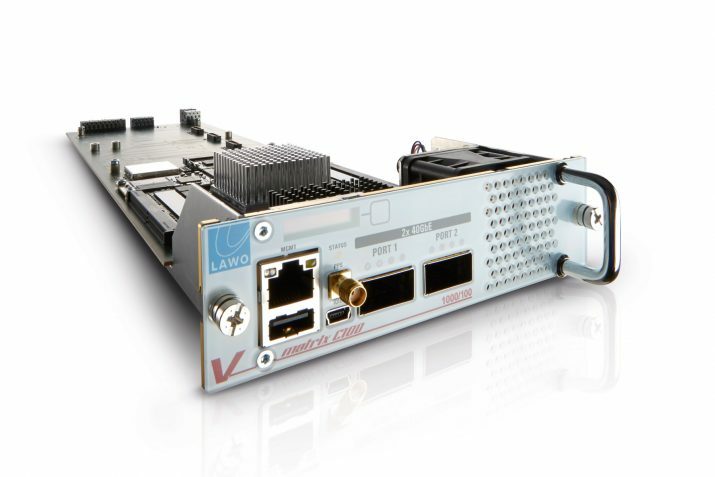 Complementing Lawo’s existing vm_mv16-4 and vm_mv24-4 multiviewer line-up, the new virtual module (VM) vm_dmv64-4 for Lawo’s V__matrix IP routing, processing and multiviewing platform breaks the mold of conventional multiviewers, providing unlimited inputs and heads, as well as full support of IP and SDI sources in 4K/UHD, 3G, HD and SD. It supports embedded and discrete audio and works with pixel perfect mosaics with ultra-low latency. Intuitive drag and drop mosaic configuration is easily done with Lawo‘s “theWALL”. Lawo’s vm_dmv64-4 is a distributed multiviewer where multiple modules network together. These modules may be hosted in the same V__matrix frame, in different frames or even at different geographical locations joining forces as long as they are networked via IP. Every vm_dmv64-4 has an input stage capable of receiving up to 24 sources of any combination of 4K/3G/HD/SD which is limited only by the physical (up to 18 SDI inputs) or network (2x 40GbE) I/O. These sources are downscaled by the vm_dmv64-4 and returned to the network as IP (RFC 4175) encapsulated mipmaps. In parallel to the input stage, every vm_dmv64-4 also features an output stage capable of creating up to four 3G mosaics (or two UHD mosaics) with up to 64 sources/PIPs each (128 each in UHD). The output stage compiles a mosaic from the appropriate mipmaps needed, automatically taking into account the size the user requests for the PIPs. The output stage can both use mipmaps that it has generated by its own input stage or by subscribing to other mipmaps from the network. As any vm_dmv64-4 can use any mipmaps from any other vm_dmv64-4 on the network it scales linearly with each vm_dmv64-4 that is added to the network which results in an “infinitely” expandable and distributed multiviewer. Last but not least: applying this solution also significantly reduces rackspace, weight and power consumption. In addition, Lawo’s V__matrix platform is already renowned for its software-defined functionality where C100 blades can be changed at run-time by loading different virtual modules. Lawo’s new smartDASH system monitoring and realtime telemetry is a vendor-agnostic enterprise software suite designed to provide full network and media visibility across an all-IP, all-SDI or hybrid WAN/LAN broadcast infrastructure. smartDASH debuted at NAB 2018. Positioned to bridge the gap between IT and video engineering, smartDASH addresses both sides of the operation to provide a comprehensive view of what a network is doing and how the media streams flowing through it are behaving. Based on a UNIX OS, this software-defined networking solution uses a powerful and robust database to document and rapidly search any aspect of the network’s operation – from a simple cable ID number to the path of a multicast across a transnational multi-hop Wide Area Network (WAN). Additionally, by leveraging a vast library of hardware communication protocols, the system automatically interrogates live and dormant path connections to create the most intuitive and data rich presentation layers of a COTS-hybrid infrastructure. With its deep packet inspection microservices, smartDASH supports monitoring and decoding of a wide range of media formats, from low bitrate OTT/ABR streams to uncompressed ST2110 studio production flows, in addition to characterizing the packet pacing off the delivery network. This unique approach provides a deep profile of operational visibility by unifying network telemetry and mixed media flow into a single-glass view. smartDASH users have a zero-footprint installation and a tool that can be deployed on on-premises (on-prem), private or public cloud services, using HTTP accessibility from a browser or mobile device. A scalable enterprise software solution, smartDASH provides data from every corner of a media network, and is able to effortlessly document all aspects of the network and its supporting infrastructure. It will visualize connectivity and bandwidth usage with precision, discover and trace live media flows from origin to destination, and convert network and media data points into actionable intelligence. Advanced telemetry agents provide both in-service and out-of-service alarm generation and reporting, alongside real-time communication and telemetry from COTS platforms to third-party purpose build equipment. All parameters, including deep packet inspection of mixed media flows, are displayed on comprehensive and unified presentation layer dashboards – awareness of speed of data lends itself directly to improved revenue. In addition, smartDASH will keep track of device inventory (including warm and cold) spares, and account for CAPEX and OPEX KPIs to manage total cost of ownership. Lawo chose the NAB Show for the international launch of its smartSCOPE deep packet inspection and network analyzer, a media-agnostic, high-density 24/7 analysis platform for IP flows in live production and delivery networks.